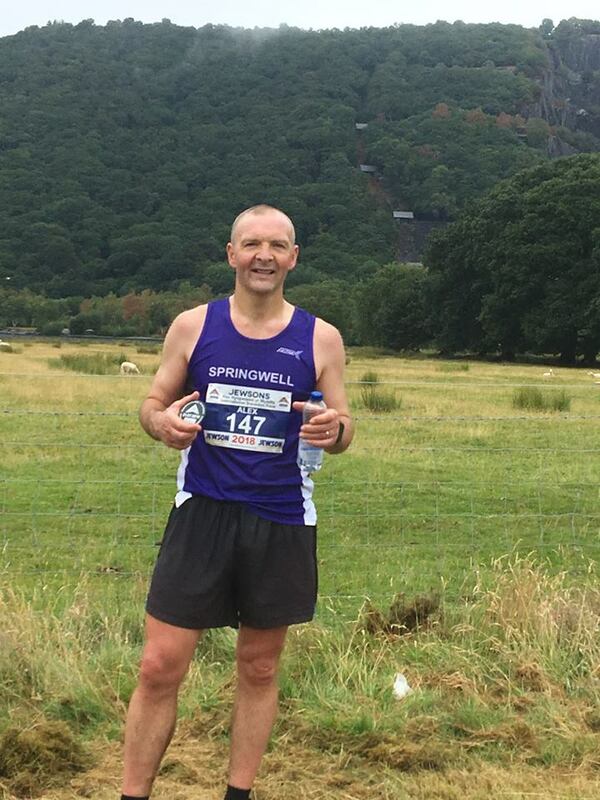 Once again Springwell RC members have been busy competing at every distance from 5k to Ultramarathon in road, trail and mountain races resulting in podium places and age category wins. This year’s Kennedy Kane McArthur Festival of Running took place on Saturday 21st July with a 5 mile road race replacing the usual 10k event and a new course for the Half Marathon. This year saw an unprecedented number of entrants with 500 competitors between both races. The overcast, slightly cooler weather of Saturday morning provided ideal running conditions at the start of both races but, as the sun broke through the clouds, and the temperature began to steadily increase the heat began to take its toll. The 5 mile race started at 10.45am and a leading group of Oliver Cook (PACE RC), Nat Glenn (North Belfast Harriers) and Jack Kennedy (Unattached) quickly formed. The relentless pace from Oliver in the first few miles saw him establish a lead which he maintained to dominate the race and win in a time of 28.16. Nat finished second in 29.46 with Jack third in 32.10. In the ladies race Caroline Irwin (Springwell RC) led from start to finish, winning in an impressive 36.34 and 15th overall. Hazel Glenn (unattached) was second in a time of 38.51 while Heather Baxter (Larne AC) took third place in 39.51. The start of the Half Marathon at 11.00am saw a small group set the pace with experienced athlete Don Travers (Newry City Runners), Paul Thompson (SpringwellRC), David Simpson (Newcastle AC), Neill Weir (Willowfield Harriers), Gary Henderson (Armagh AC) and Mark Smith (Mallusk Harriers) all in the mix. As the race progressed it was David who established a commanding lead finishing in 1.15.37, two minutes ahead of second place Neill who crossed the line in 1.17.37. It was a closer contest for third place but the experience of Don proved the difference as he finished in 1.18.20 to complete the podium. In the ladies race Louise Smith (North Belfast Harriers) won in 1.26.40 and finished 22nd overall. Amanda Perry (Ballydrain Harriers) was second and 42nd overall in 1.32.40, closely followed by Leanne Gibson (Victoria & Connswater AC) who took third and 43rd overall in 1.32.46. The International Snowdon Race is considered one of the toughest mountain races in Europe and as such attracts the elite of the world’s mountain running specialists to take on the challenge. At a mere 15.35km it isn’t exactly long but only 1km of that is on the flat. 7.16km of the course is a steep ascent with the other 7.19km steep descent and don’t fool yourself that running downhill at speed is an easy task. The elevation gained during the race is a breathtaking 994 metres. With his success in this year’s Newcastle AC Hill & Dale series, and his current standing in the NIMRA Championship Springwell RC’s Alex Brennan travelled to the event, on 21st July as the reserve for the Northern Ireland team, and since his services weren’t required for international duty there was nothing else for it but to put on the club colours and take to the start line. Continuing the excellent form that he has displayed throughout the year Alex ran a time of 1.22.26 to finish 60th overall in this impressive field of 640 finishers and tae a third place in the M45 age category. The Inaugural Seven Sisters Mountain Trail Marathon took place on Sunday 22nd July. Covering 42km through the Derryveagh Mountains competitors took on over 4,000m (13,000ft) of accumulative ascent over heathery soft ground, sheep tracks, loose stone and gravel. The Seven Peaks took the runners from Muckish to climb the peaks of Crocknalarragh, Aghla Beg, Ardloughnabrackbaddy, Aghla More, Mackoght and Errigal before finishing at back at Muckish. This is an extremely demanding event, requiring a high level of fitness and technical competence from anyone taking on the challenge. In preparation for such an event most competitors would rest in the preceding days. Springwell RC’s Alistair Shaw took a rather different approach, running a marathon on Achill Island on Friday in 4h 29m followed by a 40 mile ultramarathon on Saturday in 6h 38m. No surprise when he says that he felt like throwing in the towel after two miles, but that is not Alistair’s style and having dismissed such thoughts from his mind continued on this challenging course to finish in 10h 48m 12s to complete 92 miles of running for the weekend. Tuesday 17th July saw 300 runners take to the streets of Portaferry for the annual 10 Mile Road Race and associated 2 x 5 mile relay. In the 10 mile race Bryan Edgar ran 1.03.01 to finish 13th and win the M55 age category while Hugh Deighan finished 132nd in 1.18.49 and Elizabeth Deighan 191st with a time of 1.25.22 In the relay race Margaret Edgar, running with June Angus finished 22nd in the ladies category in 1.37.41. The ladies only Bluebelles 5km, hosted by Acorns AC took place on Saturday 21st July with almost 200 ladies taking part in this very popular event. Springwell RC was represented by three of their ladies with Majella McAteer 32nd in 24.11, Mariette Mulvenna 50th in 25.39 and Janet Patrick, who won her F55 age category 61st overall in 26.22. The Brackaghreilly 5 Mile Road Race too place on Wednesday 18th July. Springwell RC had three representatives at the event with Jim Glasgow 35th in 37.29, Michael Mulvenna 40th in 40.53 and Catherine McGilligan 61st in a time of 41.45. The inaugural Lululemon 10k took place in Edmonton, Canada on Sunday 22nd July as part of the Canada Running Series. Springwell RC had two of our members at the race with husband and wife team Simon Stewart and Mekita Aznar competing. Simon ran a 34.03 to win the M45 category while Mekita was third in the F40 category with a time of 41.21.